If you have a lot of free time in hand, you can spend your time by playing a lot of shooting games online that we have designed for our gamers. Shooting games are all time favorites and are loved by all age groups. People who believe in actions love to play these games. These games are simple to play and give a satisfactory experience when a player shoots down a whole brigand of his enemies. You can feel an Arnold or Sylvester Stallone in you when you kill a number of virtual enemies all alone. So, whenever you get time, just start your computer, connect to the internet and log on to our website for an action. 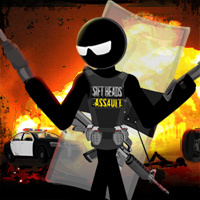 Our online shooting games are entertaining and interesting and from kids to grown ups, all love to play these games. 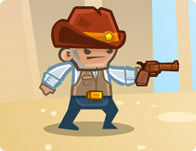 Hold your mouse and just keep firing guns on your enemies. No one should be escaped from your target. That’s the fun and excitement, associated with our shooting games that you would never like to miss. Online shooting games are your best bets if you want to spend your leisure time with fun, action and excitement. Pretend to be an FBI agent and kill those heartless terrorists who are out there on the road to create havoc among the common people. We have a large selection of theme based games. You can choose themes as per your taste and preference and get engaged killing dreaded monsters, peculiar aliens or huge creatures like dinosaurs or Godzilla. So, there is no dearth of choices when it comes to playing shooting games. Just hold the trigger and point the gun towards your target. Kill your enemies and enjoy these games. Log on to our website to pick the shooting games that appeal you the most. You would never have such a tremendous amount of fun, we can bet on that.